I enjoy a slice of cake from time to time, but I never get that excited about cake. Even though I love sweet things, I'm not a big fan of frosting. Well for the first time in my life, I've gone bananas for a cake, and the frosting. 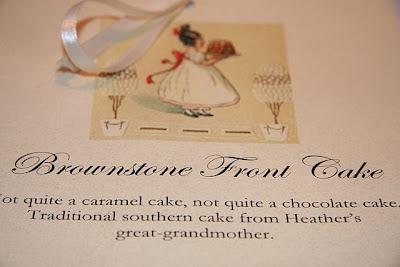 I went to dinner with friends at Volunteer Park Cafe and tried the Brownstone Front Cake for dessert. It was the most delicious cake I have ever tasted. 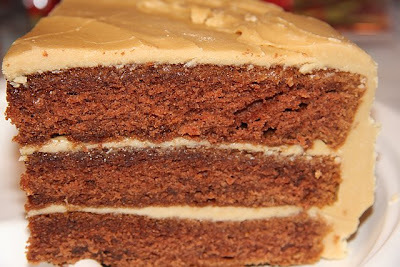 It's a chocolate caramel cake with brown sugar frosting. I was so eager to have it again that I ordered one for New Year's Eve and enjoyed it for days. I ate it with coffee for breakfast, as a snack in the afternoon and for dessert every night. It was such a huge cake that I shared it with our neighbors and they loved it so much they came calling for more! The baker/co-owner of Volunteer Park Cafe says that growing up in the South, her family ate a Brownstone Front Cake for every gathering... birthdays, showers, celebrations, even funerals. I think I might have to start that ritual so I have an excuse to order it a few times a year. You can read more about this decadent dessert (and get a recipe for one) from another Brownstone Front cake fan on the Wise Craft blog. She says it's a "once a year cake" though and I disagree. I'm trying to think of any excuse to order another one.